Posted on February 28, 2019 by William A. 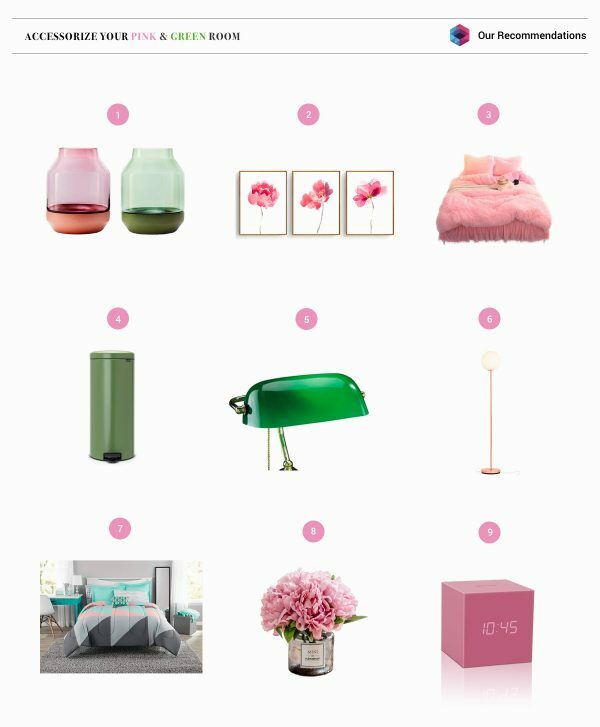 Whether you are a fan of a color clash or not, pink and green just seem to work great together in the land of modern decor. 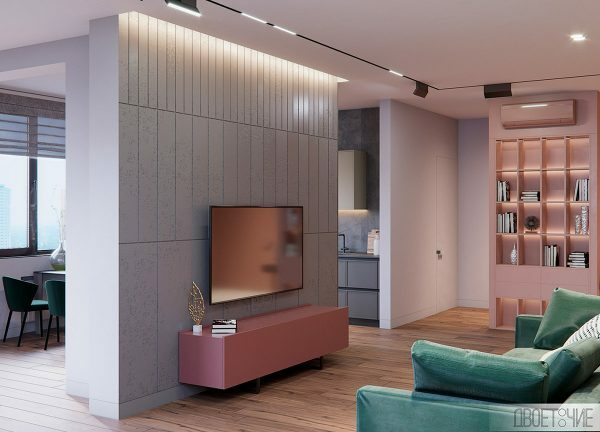 Olive green and blush pink tones marry in sweet harmony whilst still maintaining just enough of the clash factor to create a subtle buzz in the finished effect. 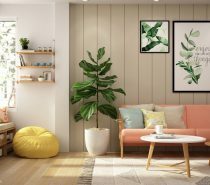 With that in mind, we have decided to bring together a gallery of three gorgeous home tours that do pink and green decor in exciting and original ways. 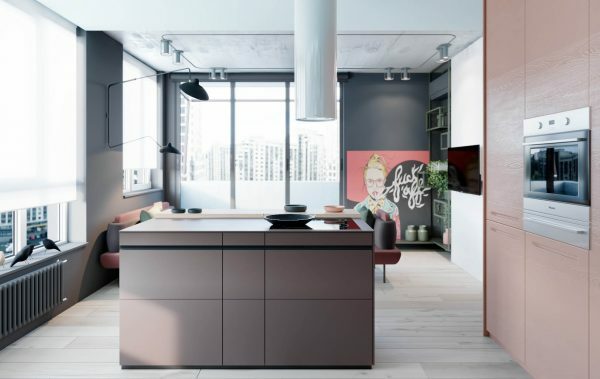 Hopefully these sleek home tours will inspire you to roll up your sleeves and get out the colour swatches to create your very own. 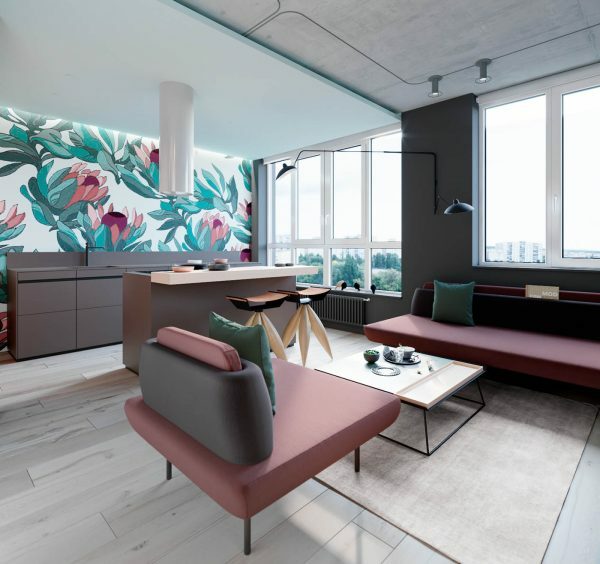 A bold floral print sets a tropical tone inside our first modern living room. 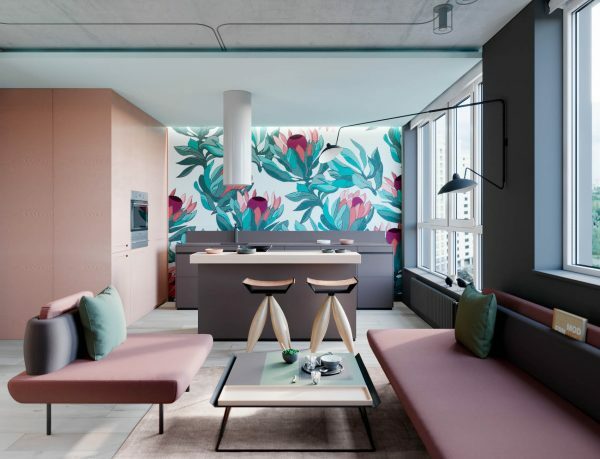 The colourful accent wall brings depth and quirky character to a grey kitchen installation with island toward the back of the open plan room. A slender white chimney style cooker hood causes minimal disruption to view of the brave feature. Unique bar stools hang out next to the central kitchen island, with petal profile wooden legs that tie in with the theme of the floral feature wall. 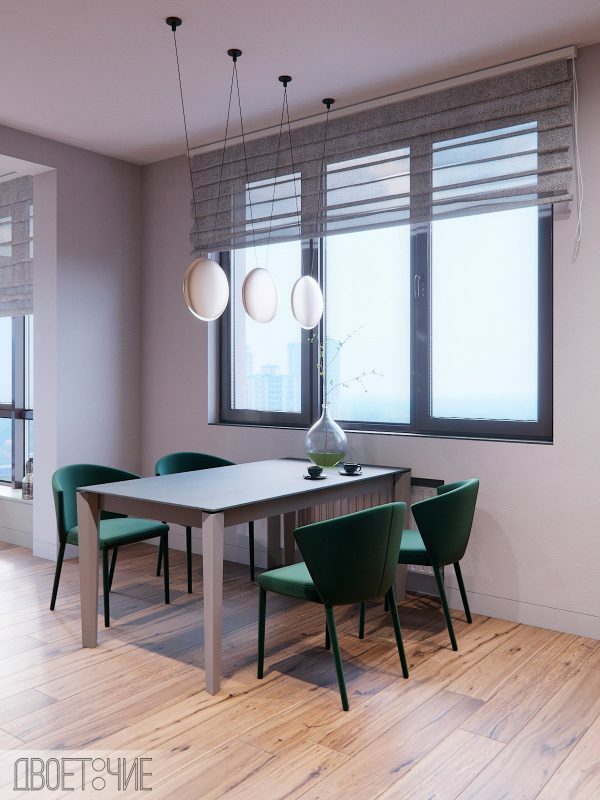 A dual headed swing arm wall lamp illuminates both the breakfast bar and the lounge. 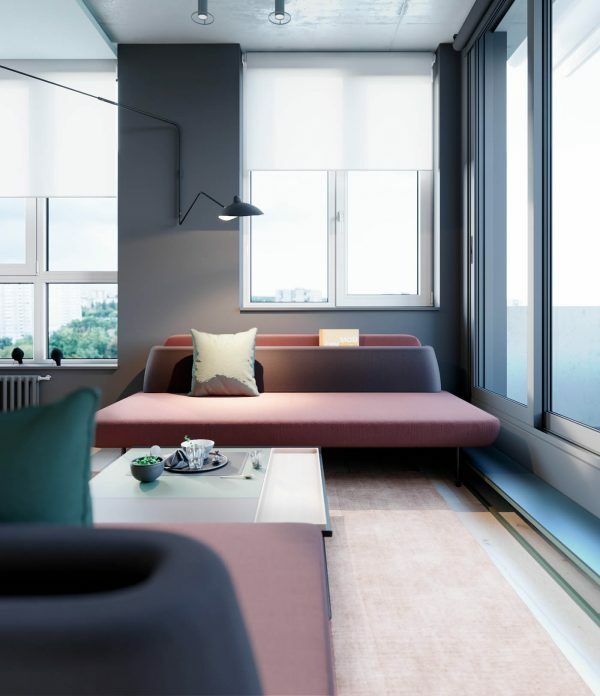 Two pink and grey upholstered sofas face each other across the room, with a square modern coffee table marooned between. 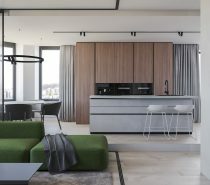 A neutral area rug holds the lounge arrangement together, and complements the timber breakfast bar counter that attaches to the grey kitchen island, and the wooden legs of the kitchen bar stools. 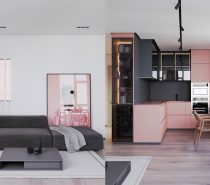 One side of the kitchen is a full height volume of pink cabinets. The hob is installed in the worktop of the grey island so that the chef can look into the living room as they cook a meal. See more ideas for kitchen islands. 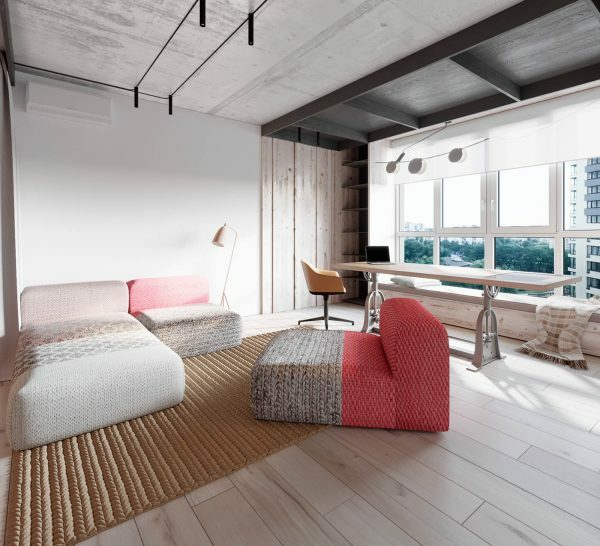 A separate room holds an industrial workspace setup, with another comfortable lounge area tagged on. 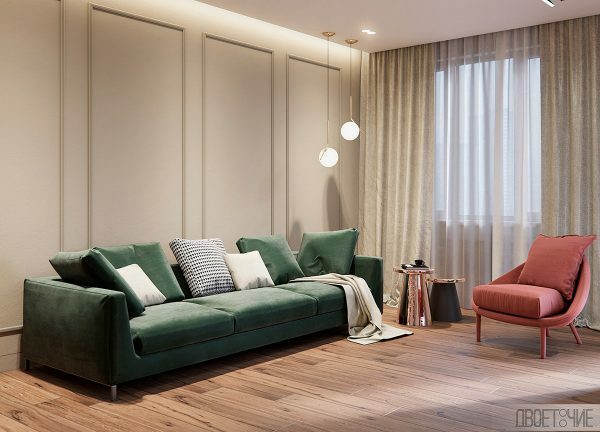 The sectional couch is made up of mismatched fabrics, of different colours and textures, which gives a beautiful layered effect. 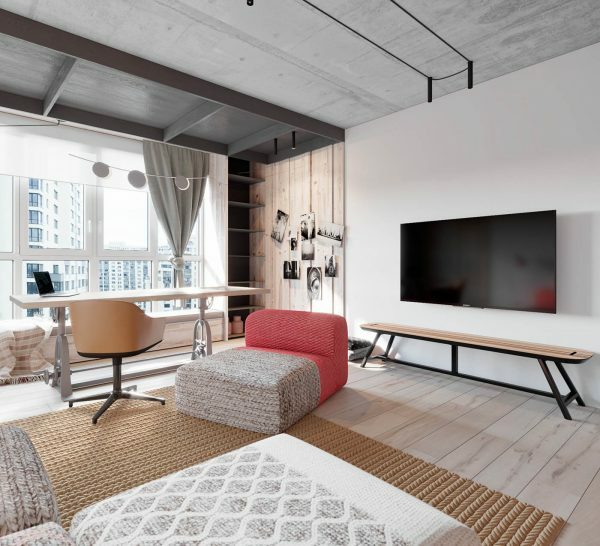 A simple bench underlines the tv as a media shelf. Black electrical wires tightly cross a concrete ceiling above the lounge. Circular light shades are strung along a relaxed low hanging wire above the desk, like beads on a necklace. 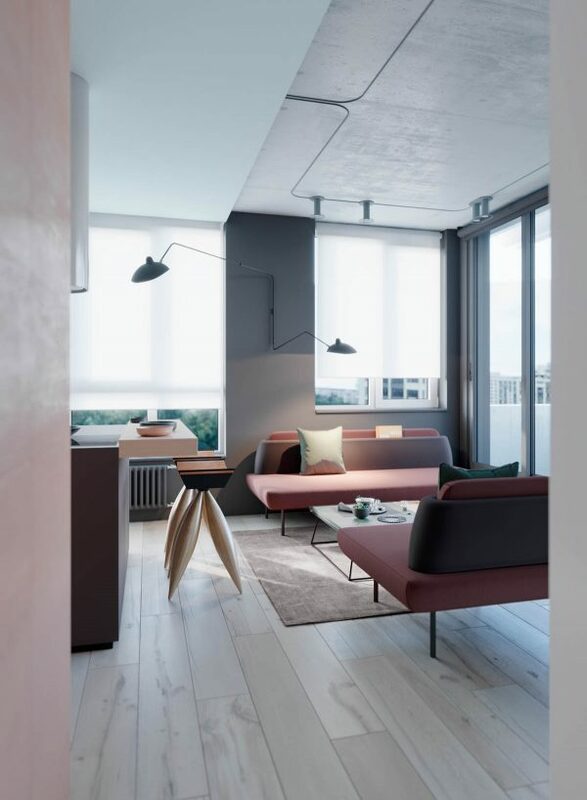 A pink floor lamp provides task lighting at the sofa. See more floor lamps. 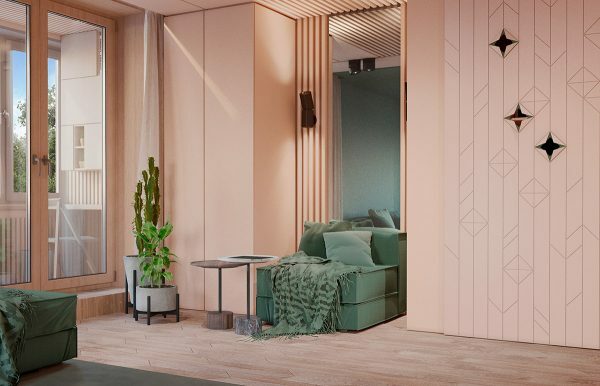 Our second home is an all encompassing colour combo of solid pink and green volumes. 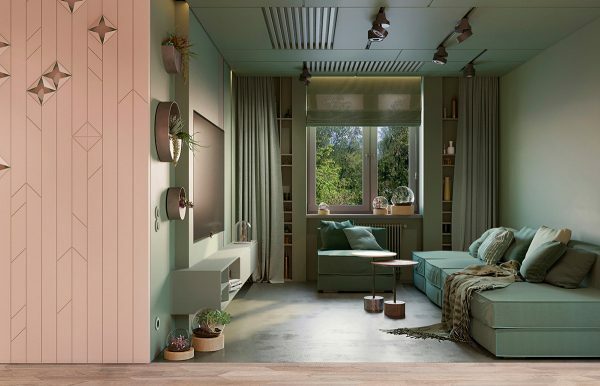 A green living room is filled with green sofas, green curtains, green shelves and a green modern media unit. Even the ceiling is green. 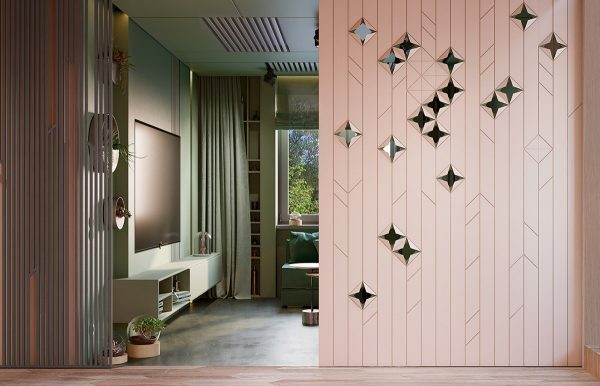 Pink sliding doors can be drawn across the entryway to the living room, to screen the green. 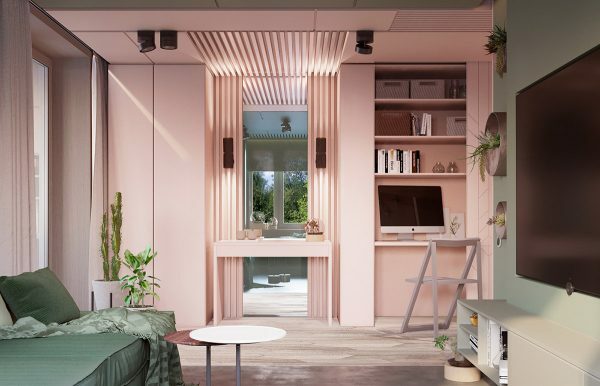 A minimalist workspace is situated opposite the green living room, hidden inside an entirely pink wall of storage units. The sliding doors were installed so that one person could use the work space and computer and not bother those who are relaxing in the living room. 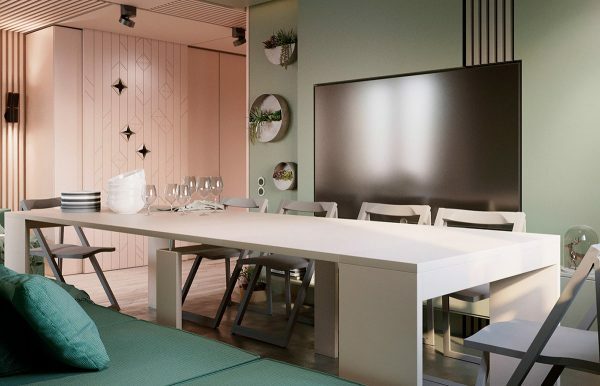 An extendable dining table can be pulled out for use in front of the living room sofa. Fold out dining chairs can be tucked up around the other edges. Slats stripe the tv wall decor. Circular planters dot the other side. 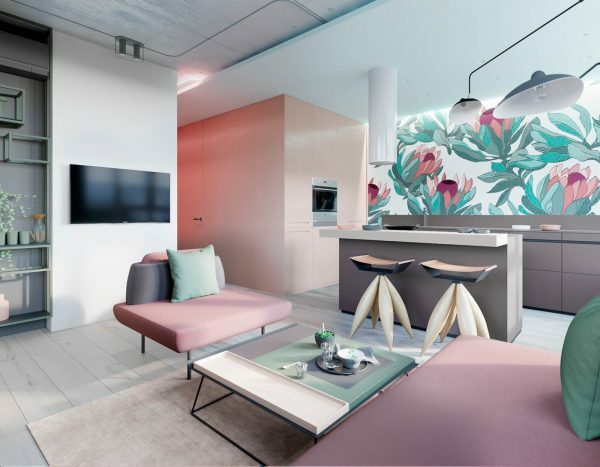 Unique plant stands bring the greenery of indoor plants over to the pink side of the open plan. 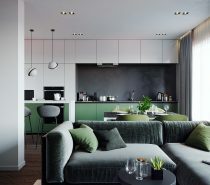 When the pull-out dining table is in use, the end section of the sofa moves out to make space. Perforations pattern the sliding doors. 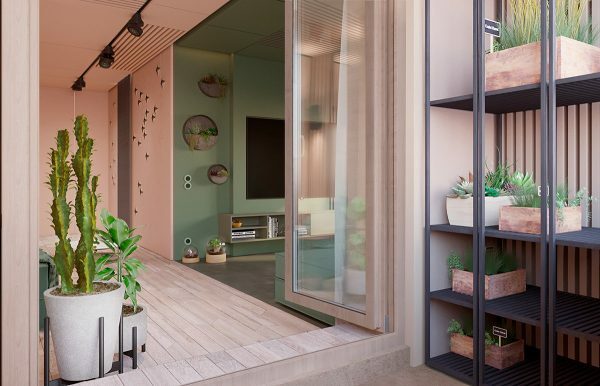 The designers came up with a systemised task space for seasonal seedling nurturing on the balcony. 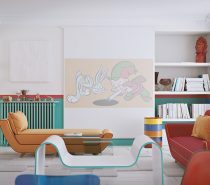 The two colors visually divide the space into clear zones. 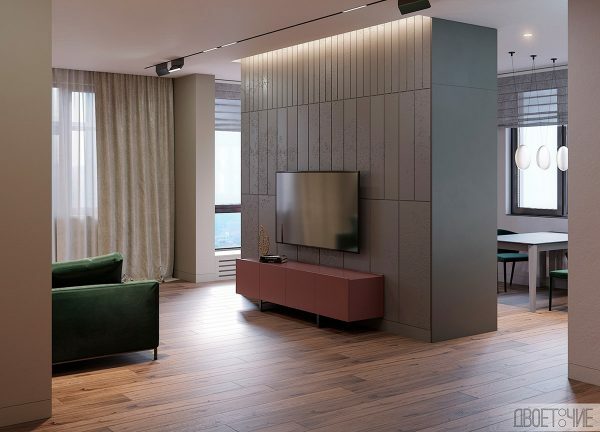 Our third tour takes place in a 120 square metre apartment in Kyiv, Ukraine, with beautiful views of the Dnieper and the right bank of Kiev out of panoramic windows. A welcoming soft shade of pink greets us in the entryway. 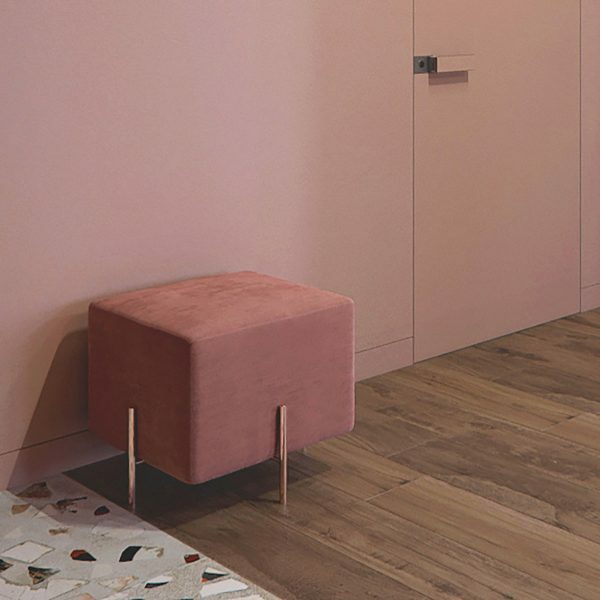 A plush pink stool with rose gold effect legs waits by the door. 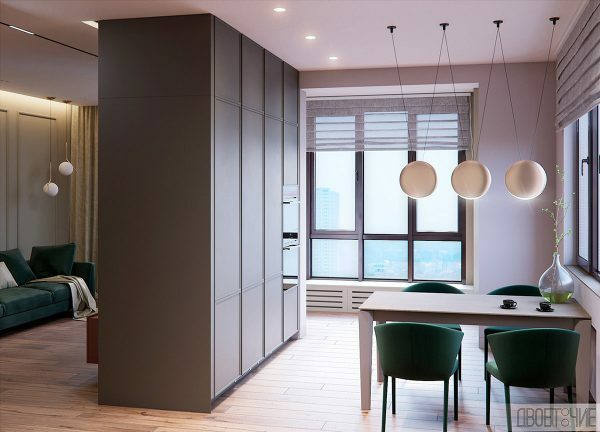 All of the doors throughout the apartment have been flush-mounted; the omission of typical platbands means that the doors almost disappear into colour matched walls. 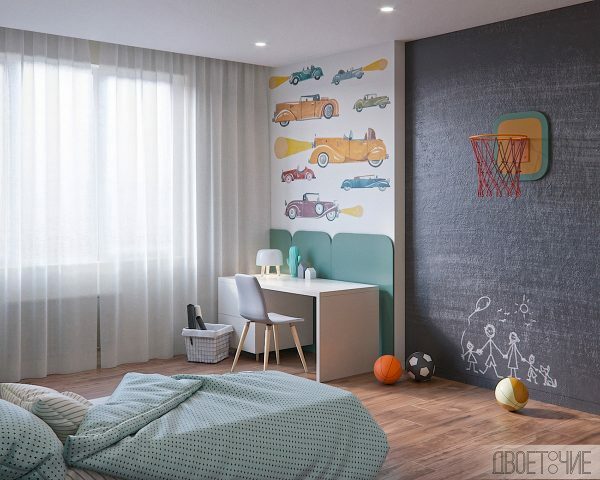 The smooth and uninterrupted finish helps make the rooms appear less cluttered and more spacious. Modern terrazzo patterns the entryway floor. 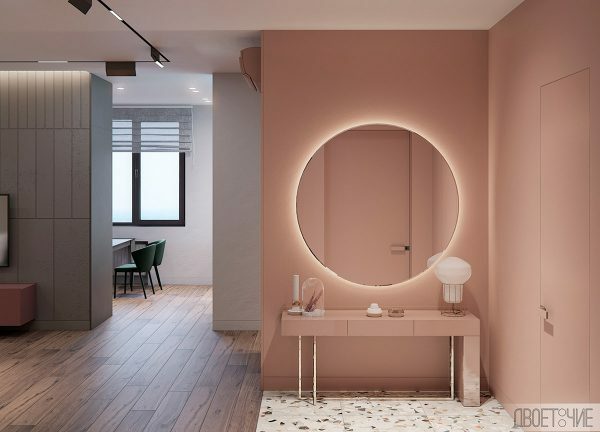 At the end of the run there stands a sleek pink vanity table. 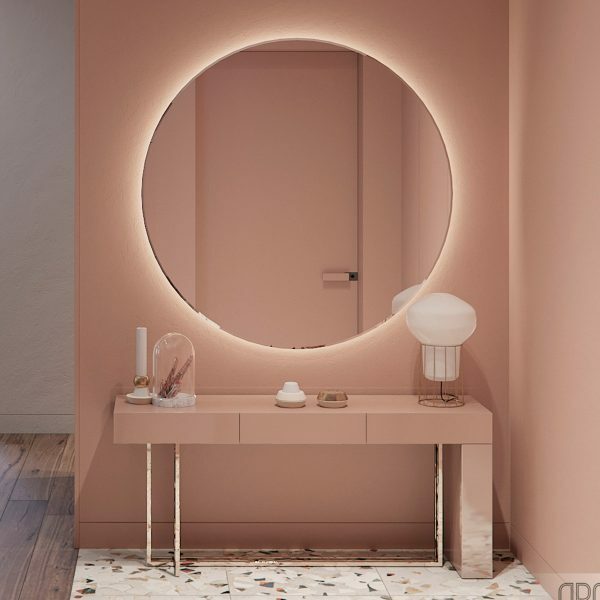 An illuminated vanity mirror throws a ring of light onto the pink wall. The entryway stands open to the main living room. 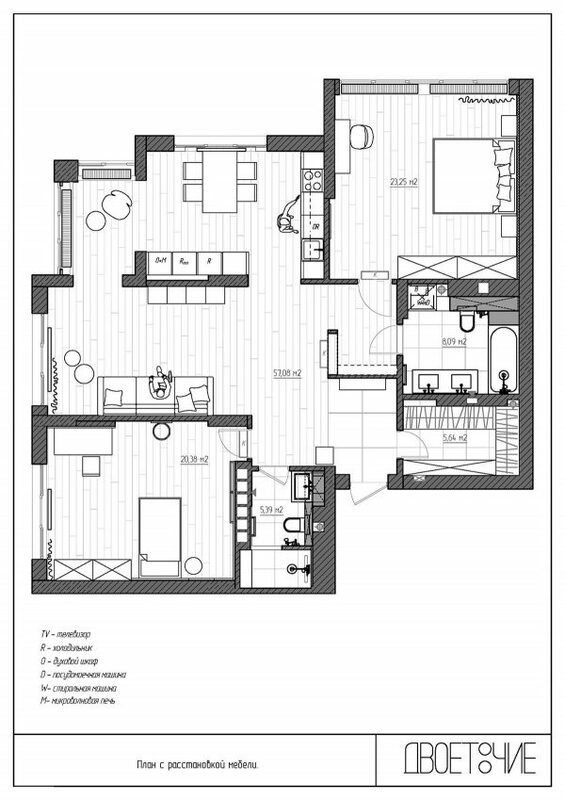 The redevelopment of the apartment involved removal of all corridors so that the floor area could be fully utilised. All of the rooms now flow directly into the large family room. 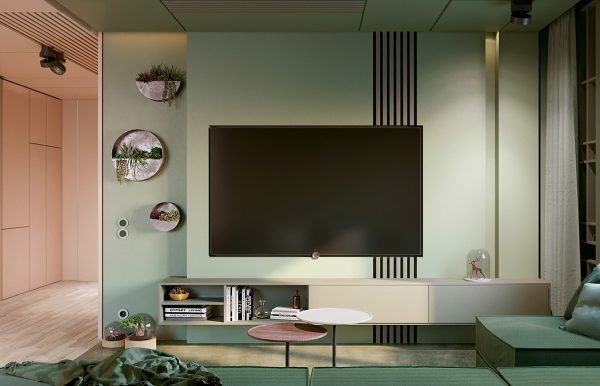 Grey tiles clad the tv wall, and a floating pink media unit underlines the flat screen. 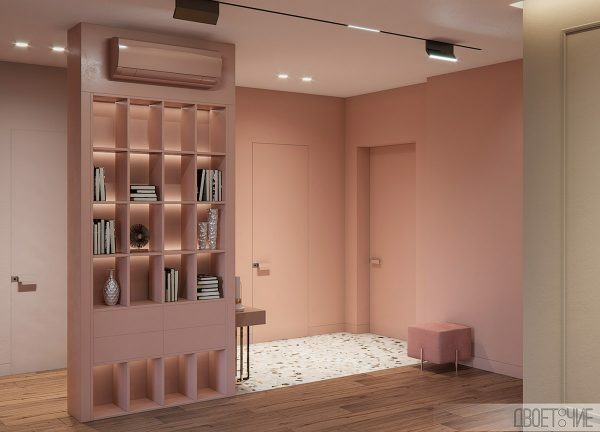 A backlit pink bookcase acts as a partial room divider between the lounge and entry hall. Gold small side tables stand between a green sofa and an eye-catching pink modern accent chair. 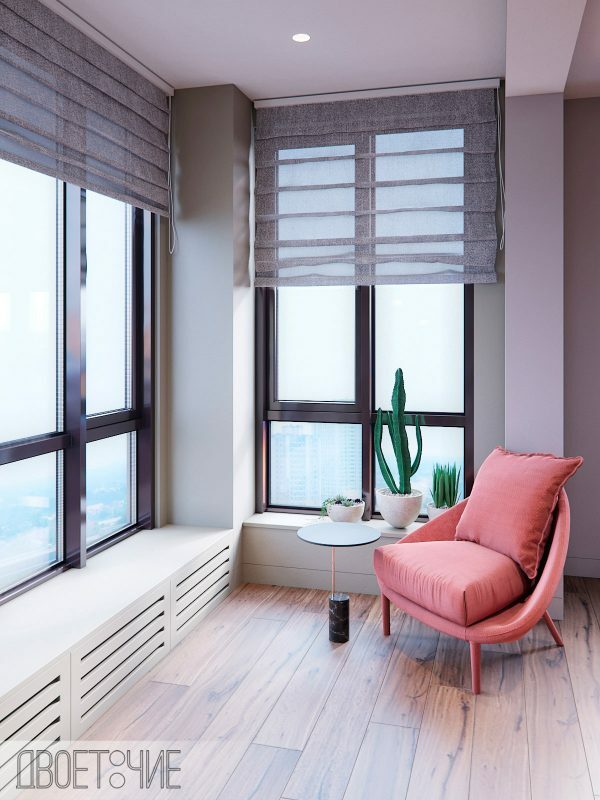 A matching pink chair is positioned in the window, as a place of contemplation with a view, or as a bright reading nook. Indoor plants mix in emerald tones. 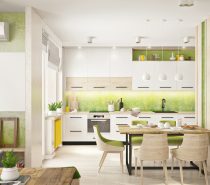 Modern dining room pendant lights provide a focal point in the kitchen. 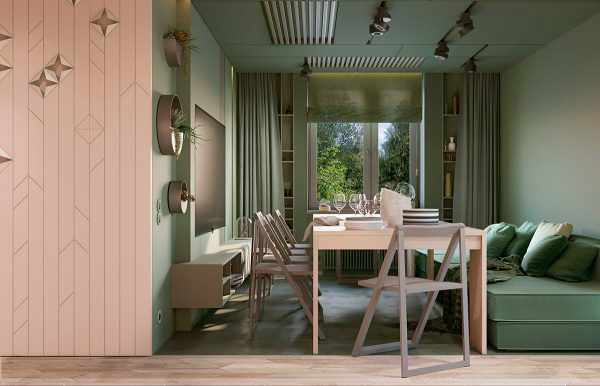 Green dining chairs bring weight to the neutral space. A wall of grey kitchen cabinets obscure the lounge from the dining room. The end of the kitchen that is viewable from the lounge appears as a grey one wall kitchen. 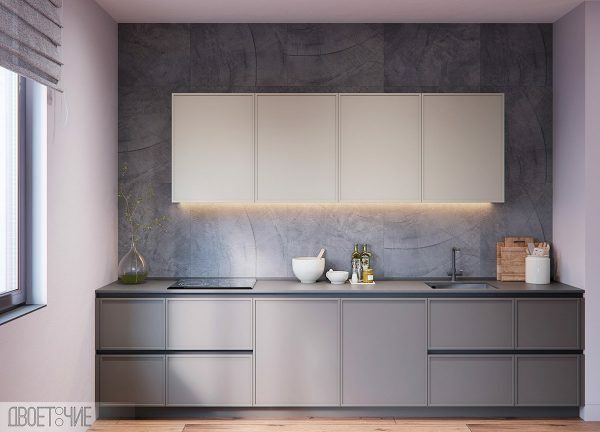 See more grey kitchens. 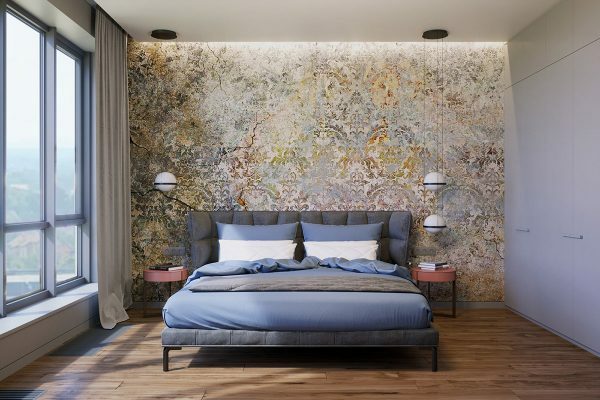 Unusual wallpaper with a delicately distressed effect colours the bedroom. 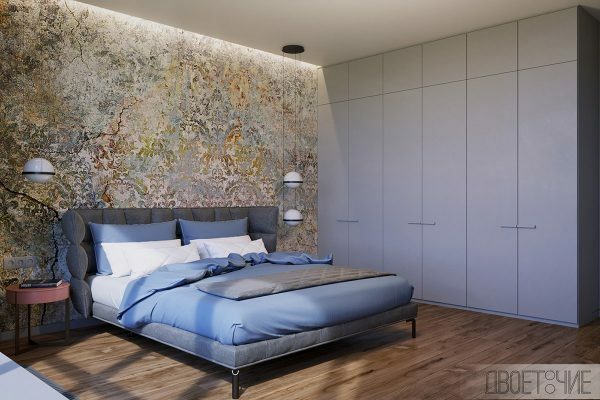 Low hanging bedroom pendant lights cross the pattern at either side of a grey platform bed. Blush bedside tables pull out the pink shades in the wallpaper. 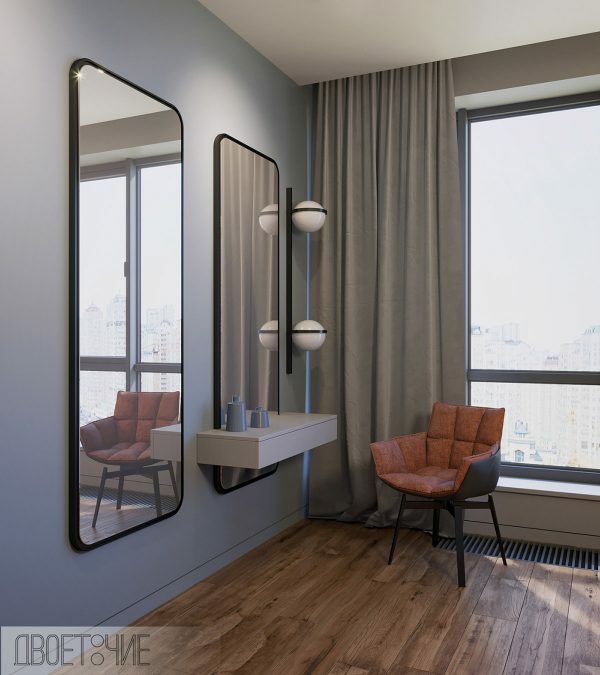 A floating vanity cuts across a wall mirror. 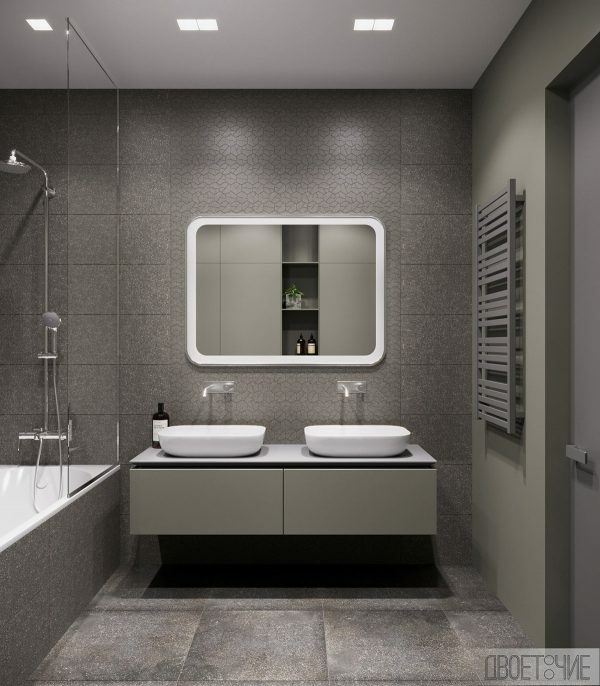 Textured grey decor fills the bathroom, along with a simple over-bath shower and a double sink bathroom vanity. 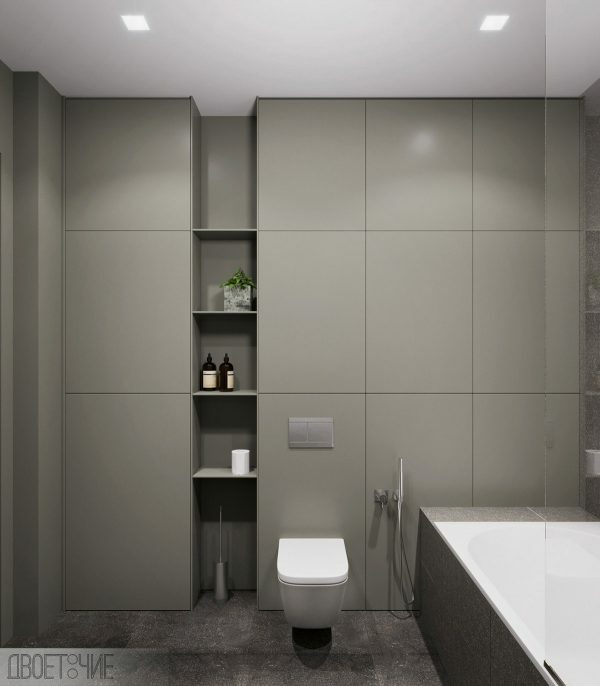 Storage units are concealed along the opposite wall of the bathroom. 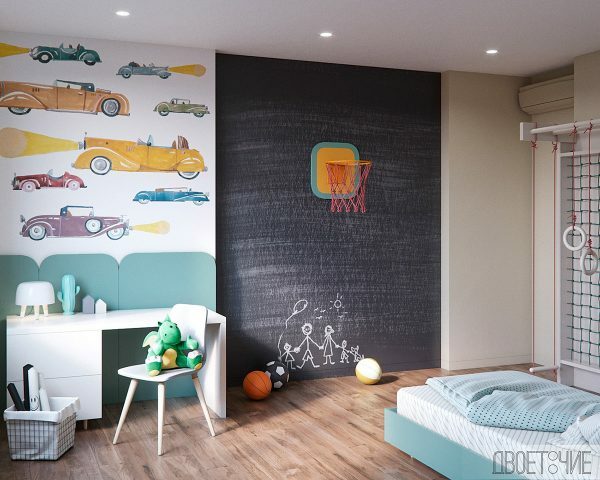 Bespoke teal and grey headboard panels create a unique look inside the kid’s bedroom. 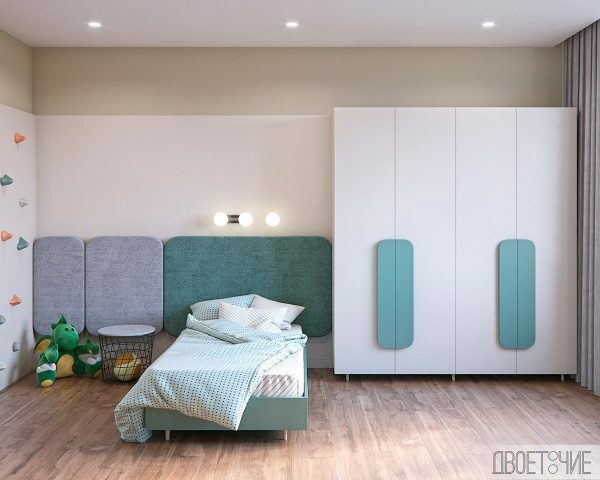 See more ideas for kids’ beds. 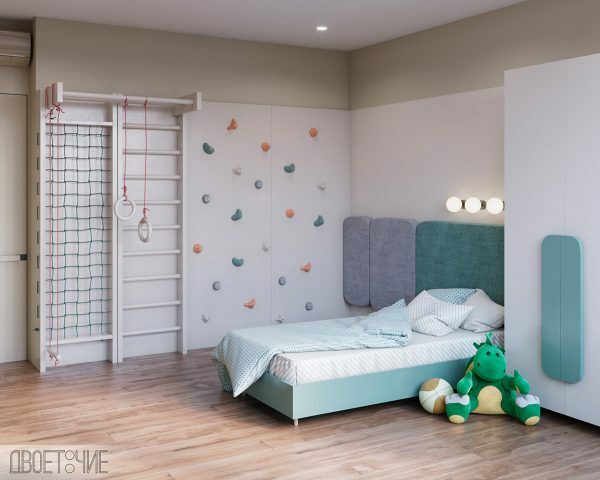 A kids’ gym and climbing wall makes good use of narrow space by the bed. Teal panels behind the desk match the unique headboard design. Chalkboard paint leaves blank space for creativity. 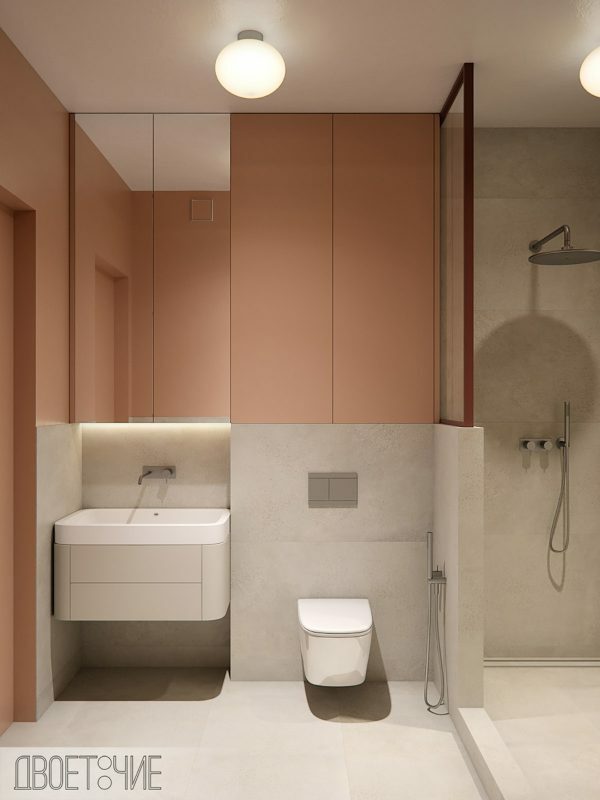 A modern bathroom vanity nestles inside a small blush and white bathroom. 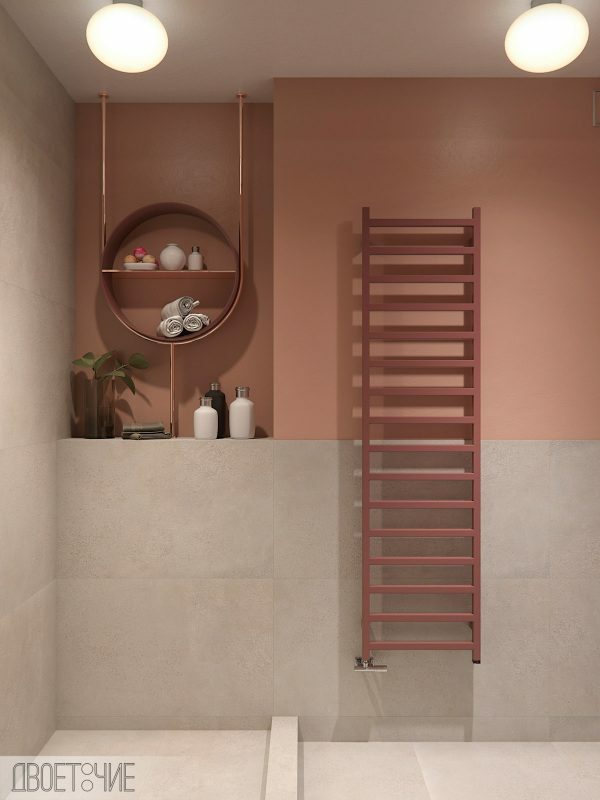 A pink heated towel ladder climbs the wall.